“So there were gnats on man and beast. 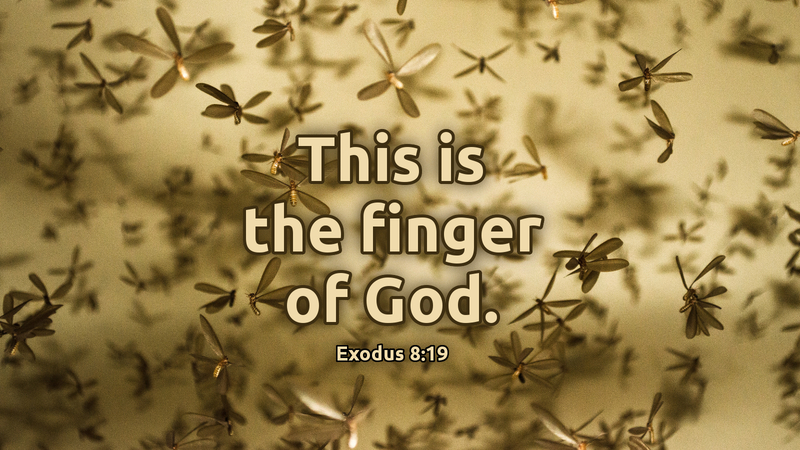 And the magicians said to Pharaoh, ‘This is the finger of God.’ But Pharaoh’s heart was hardened, and he would not listen to them; as the LORD had said” (Exodus 8:18–19). I couldn’t ignore the plagues the Lord worked through Moses against Pharaoh, so our daily lectionary reading tells of several, ending with “gnats.” Oh, sure, you say gnats aren’t so bad! Well, if you’ve ever lived in a very humid climate (Indiana, for example) you know how troublesome gnats can be. Exodus tells us that Moses had Aaron strike the dust of the earth, and there came gnats on man and beast—for the dust of the earth BECAME gnats! And the Pharaoh’s magicians were finally convinced and said to Pharaoh, “This is the finger of God!” Without a doubt, they now knew that this was no magic or slight of hand—this was God’s doing in their sight! And would Pharaoh relent? Would Pharaoh give in and let the Israelites go? The Scriptures tell us that his heart was hardened, as the Lord had said. We have a hard time understanding the “hardness of heart” thing. It seems at times that the LORD God hardened people’s hearts. At other times, it seems we harden our own hearts against God. I have no great answer or explanation for this, except to say that it is meant to help us understand how it is that people turn against God so completely. And wouldn’t that explain how today so many people are so dead-set against God? It has to be a hardening of the heart—a complete closing off of yourself from God and anything having to do with God. Even when it is obvious that the “Finger of God” is at work, still some won’t believe or acknowledge God’s presence or working in the world. The best we can do for such hardened people is pray for them. Pray that God will soften and open their hearts to His Word and Will. Pray that God will turn them toward Him so that they might finally receive Him. That would be a good thing to pray for during Lent—that God would soften hardened hearts! Prayer: Lord our God, open the hearts of those who are closed to you. Especially touch the hearts of our loved ones who have turned away from you, that they may come to you and live; through Jesus Christ our Lord. Amen.